The time it takes any particular bed bug nymph to develop depends on the ambient temperature and the presence of a host. Under favorable conditions, such as a typical indoor room temperature (>70° F), most nymphs will develop to the next instar within 5 days of taking a blood meal. If the newly molted instar is able to take a blood meal within the first 24 hours of molting, it will remain in that instar for 5-8 days before molting again. At lower temperatures (50° F – 60° F), a particular instar may take two or three days longer to molt to the next life stage than a nymph living at room temperature. 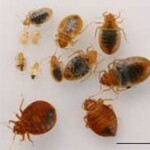 However, if a bed bug nymph does not have access to a host, it will stay in that current instar until it is able to find a blood meal or it dies. The time for a bed bug to develop from an egg, through all five nymphal instars, and into a reproductive adult is approximately 37 days. 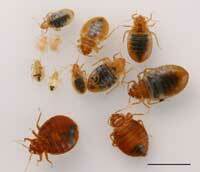 Even under the best conditions some bed bug nymphs will die prior to becoming adults. The first instars are particularly vulnerable. Newly hatched nymphs are exceptionally tiny and cannot travel great distances to locate a host. If an egg is laid too far from a host, the first instar may die of dehydration before ever taking its first blood meal. However, laboratory studies have found that overall bed bug survivorship is good under favorable conditions, and that more than 80 percent of all eggs survive to become reproductive adults.